The first issue of the Palestrica of the Third Millennium journal was published in August 2000, year in which two other issues were released. Since 2001 the journal has been published quarterly. At present, the journal is edited by the “Iuliu Hatieganu” University of Medicine and Pharmacy of Cluj-Napoca and the Romanian Medical Society of Physical Education and Sports, in collaboration with the Cluj County School Inspectorate. Indexing: EBSCO, Index Coper­nicus, DOAJ, CiteFactor, Crossref. Palestrica of the Third Millennium – Civilization and Sport is a journal rated B+ by CNCS (Romanian National Research Council) since 2007, certified by CMR (Romanian College of Physicians) since 2003 and CFR (Romanian College of Pharmacists) since 2015. 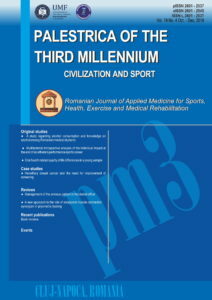 Palestrica of the Third Millennium – Civilization and Sport is Romanian Journal of Applied Medicine for Sports, Health, Exercise and Medical Rehabilitation, a journal with a multidisciplinary approach in the fields of biomedical science, health, medical rehabilitation, physical exercise, social sciences applied to physical education and sports activities. In order to check the quality of articles submitted for publication, the Palestrica of the Third Millennium – Civilization and Sport journal applies the method of single-blind peer review (the identity of reviewers, but not authors, is kept anonymous).